I’ve been wanting to add a chalkboard into my kitchen for some time now, and this cookie sheet chalkboard was very quick and easy to create. It’s a great place to write down things that we need as soon as we’re out so we don’t forget. Frankly I need all the help I can get with remembering things. Last month’s challenge was license plates, and if you missed it you can still check out my license plate wind chime. I can’t wait to see what my blogging friends have come up with for this month’s chalkboard project. There are links to all their fabulous projects at the end of this post so be sure to check them out. 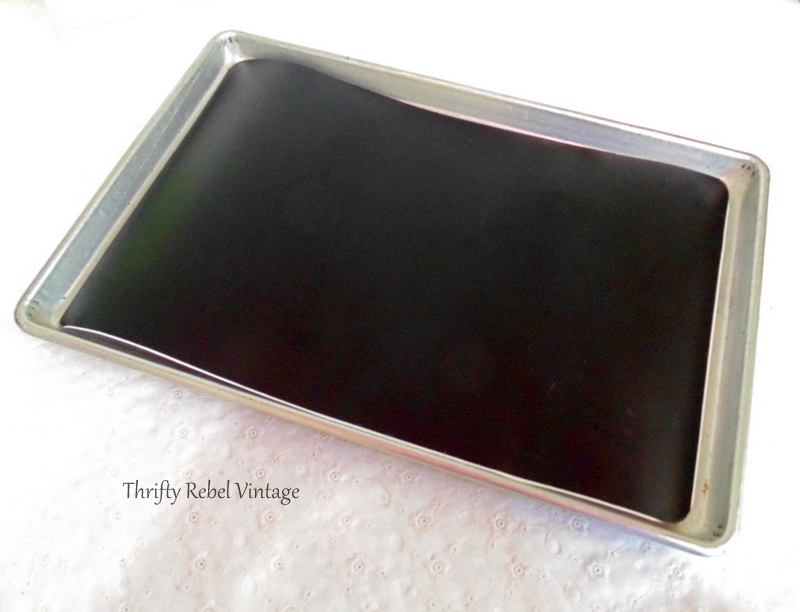 For my cookie sheet chalkboard I’m using a vintage aluminum pan from my vintage bakeware stash. Actually everything for this project came from my thrifted stashes so it was very inexpensive. I’ve had this 12′” x 18″ cookie sheet for awhile waiting to find another one for a completely different project, but that’s going to have to wait now because it was the perfect size for this project. 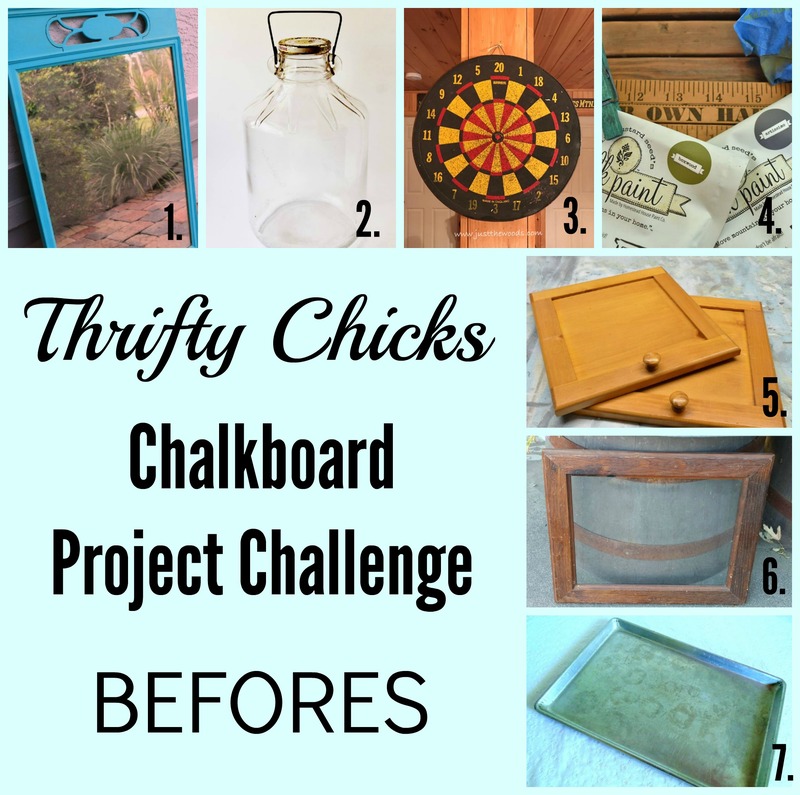 I’ve used chalkboard spray paint many times, like on my wardrobe into computer armoire makeover and these copper platter chalkboard wind chimes, but I’ve never used adhseive chalkboard vinyl . Because this baking sheet is quite used and scratched up I thought it best not to use paint, so it was the perfect opportunity to give this vinyl a go. I thrifted some what seems like forever ago and finally got to try it out. 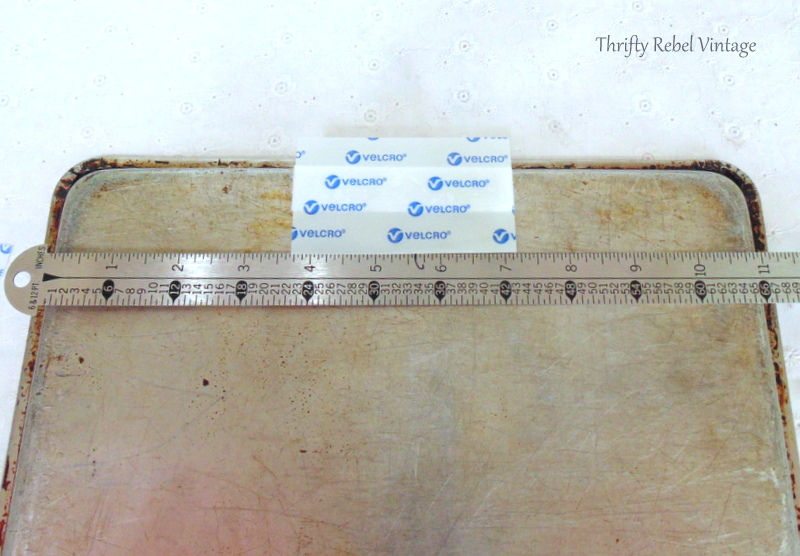 I measured the inside of my cookie sheet and marked the backing of the vinyl with pencil. Then I cut it with scissors. I did a dry fit and cut the corners a bit so they’re rounded. I’ve never used this stuff before so I thought it best to cut just a bit of the plastic backing off so I could get the top area set in place before removing the rest of the backing. 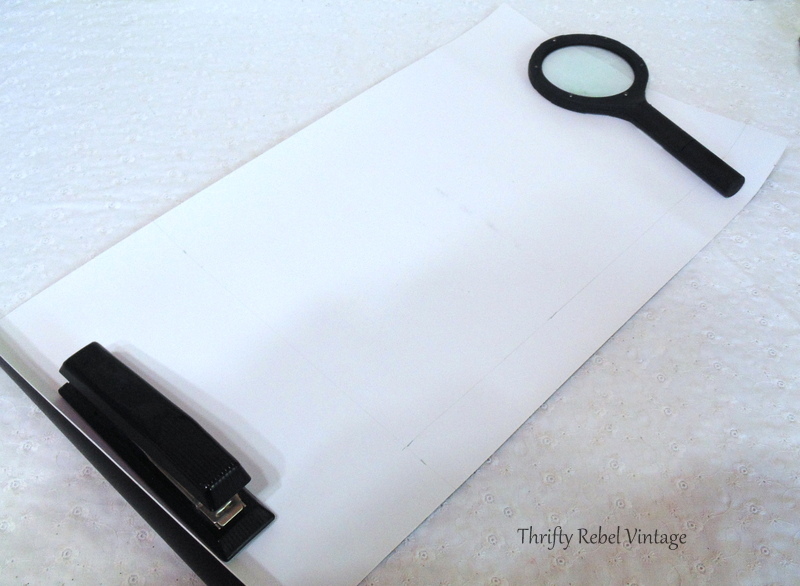 This worked well and the vinyl is repositionable if you remove it slowly and carefully. It took me three tries to get the top area lined up just right. I did a second dry fit with the rest of the vinyl and was happy with it, but it looked very plain so you’ll see down below what I did to dress it up a bit. Then I just flipped the vinyl over so I could easily pull down the rest of the backing. 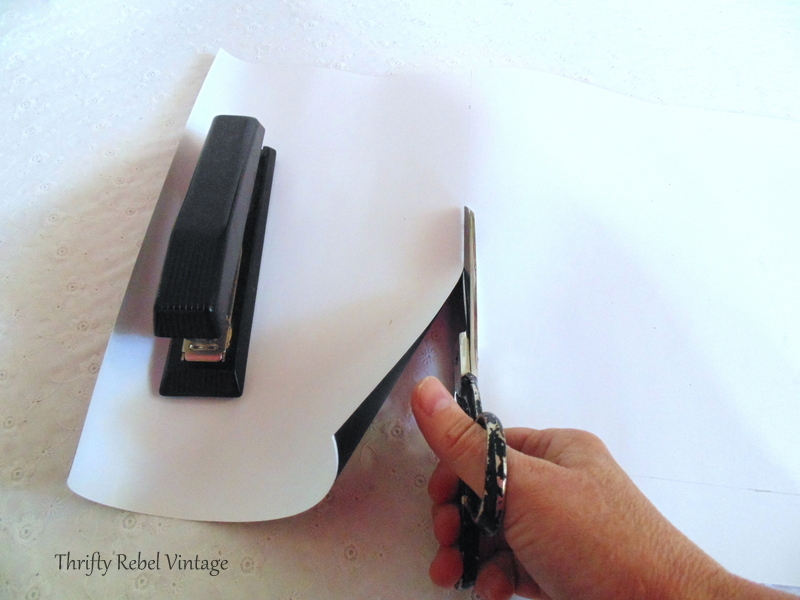 I rolled up the backing as I moved along, removing any air lumps and bumps with my fingers. 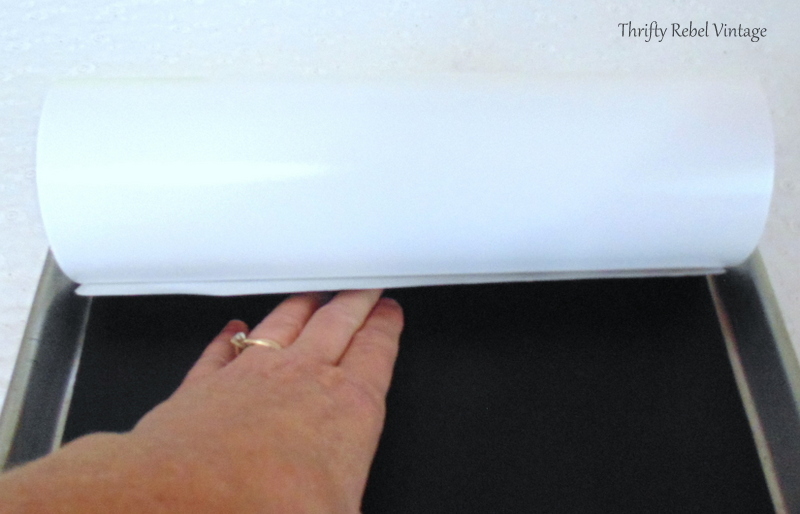 Then I pushed the vinyl down the entire length of the cookie sheet. As I mentioned at the dry run stage, I thought it looked a little plain so I decided to dress it up a bit with some faux pearl beaded garland from my Christmas stash. 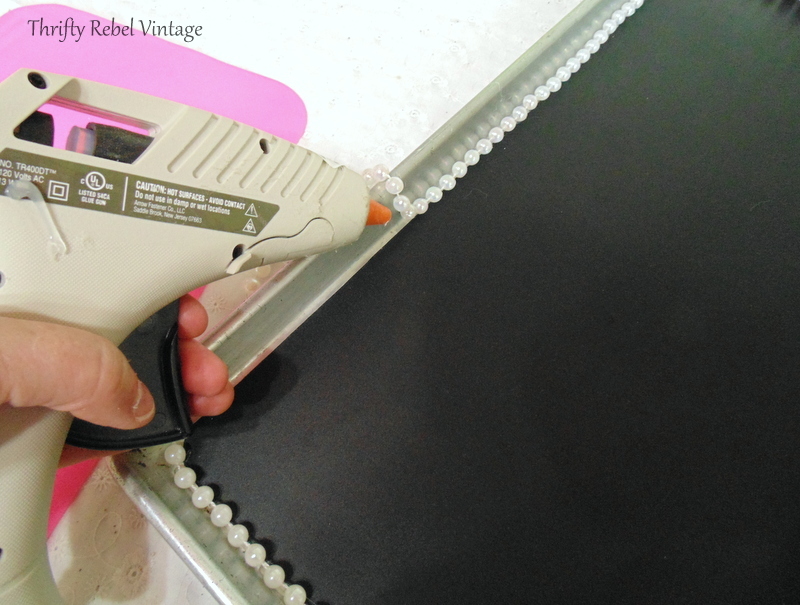 I used my glue gun and did about 4″ of the garland at a time. The glue dries very fast so it’s best to do it in small lengths. I had some velcro strips in my stash so I decided to use them for hanging by adding a strip to the top and bottom of the pan. Because this pan is aluminum it’s not very heavy and the velcro is definitely strong enough. You’ll see why I centered the strips in a minute. I added a thrifted cream horn baking cone with my glue gun to hold a piece of chalk and I was done. I blinged it up with a silver coloured vintage earring dangle. 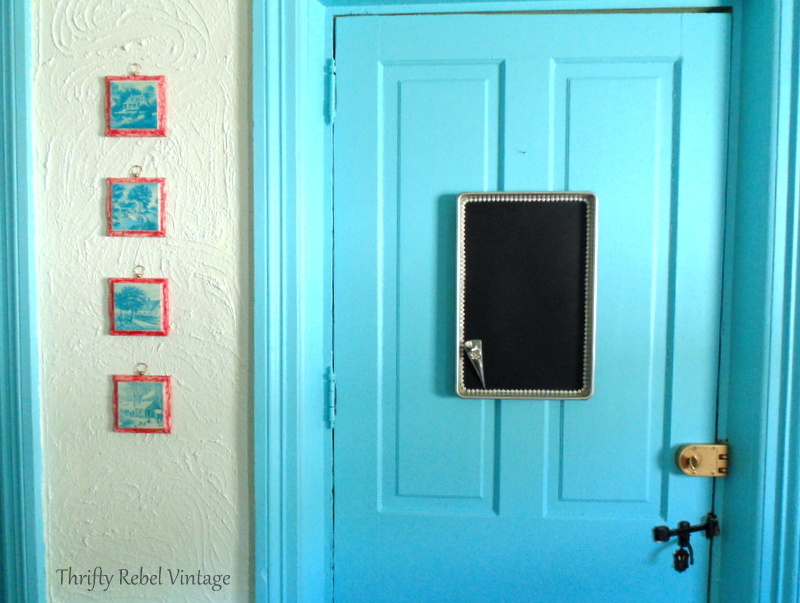 And here’s my vintage cookie sheet chalkboard ready to hang. So here’s the reason why the velcro had to be centered on the back of my cookie sheet chalkboard. Our original kitchen door has inset panels that are not flush with the centre part of the door, which means it sits flat on the centre part but not anywhere else. Besides the wall where my 4 country framed scenes are this is the only place for my chalkboard to hang, and I love those pictures where they are so they’re staying. Because the velcro strips are quite wide they hold my cookie sheet chalkboard in place very nicely. If is was a real problem I could easily place something in behind so the chalkboard doesn’t move, but it’s not that big a problem. I added a red ribbon bow from my stash onto the nail that was already in the door. It hangs down behind the chalkboard and makes it look like the whole thing is hanging from it, which is not a good idea because this is the main door that we use all the time. The chalkboard had to be permanently affixed in place or it just might end up on the floor when we open or close the door. The red ribbon ties the cookie sheet chalkboard in with the rest of my kitchen. If I was a chalkboard artist I might draw different scenes on it for different seasons and holidays, but that’s so not my forte and not what this project was about for me. But it could certainly be done for that reason. This adhesive vinyl worked perfectly for my cookie sheet chalkboard, and I’m looking forward to trying it again in the future. The cool thing about it is there’s no mess, the chalkboard is ready to use right away without any prepping of the surface, and it’s quick… no drying time like with paint. To clean it I’ve been using a slightly dampened cloth, but you clean it with dry cloth as well if you don’t mind the chalky grayness that’s left behind. Now I’ll have no excuses for forgetting when we need something. All I need to do now is remember to write it on the chalkboard. 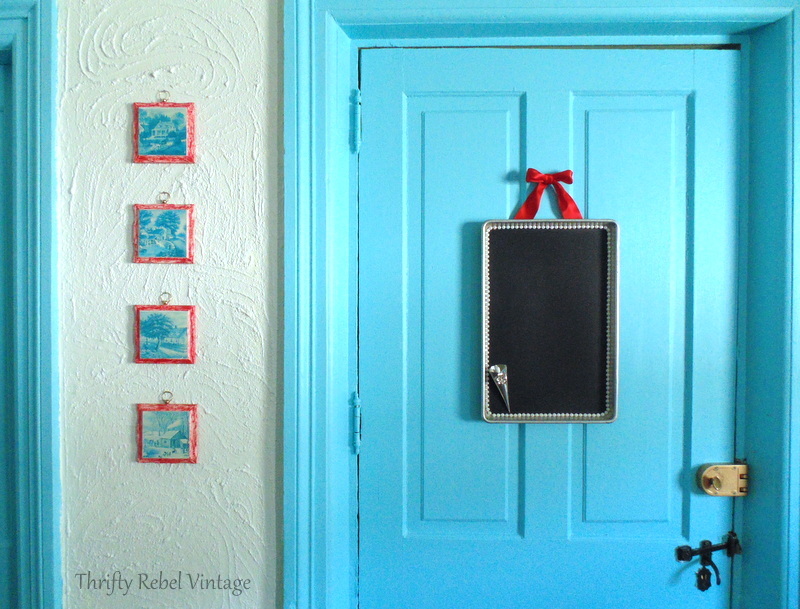 Now be sure to check out what my friends did with their chalkboard projects. That looks great. and such an easy project. 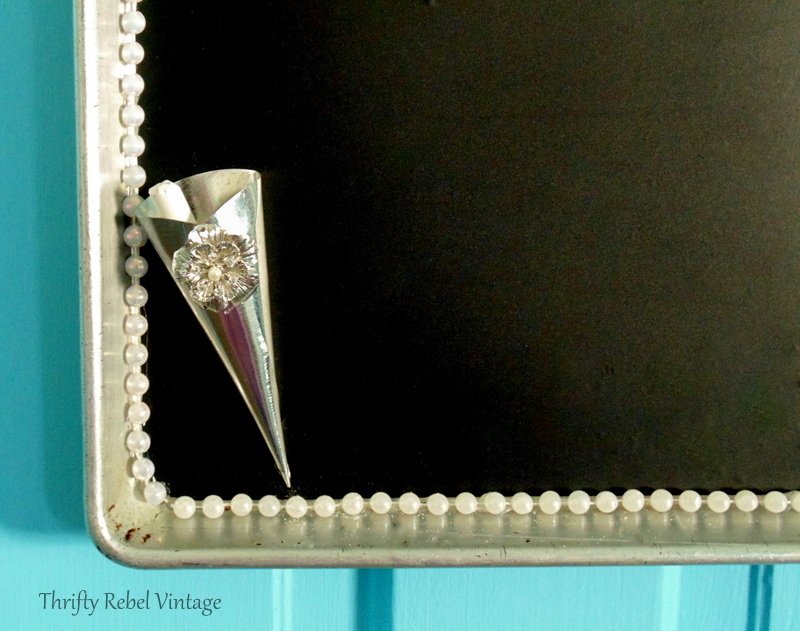 Like your bead garland trim as well as your chalk holder. Very classy and looks great on your door. May I ask where you got the vinyl from? I hadn’t noticed if the craft stores (Michaels or Hobby Lobby) have it or not; but then, haven’t really looked, as I go in, get what I need and back out again so haven’t really looked around. Hopefully one of the craft stores carry the chalkboard vinyl. Thanks Colleen! I was happy with how easy the vinyl was to work with. I found mine at my local thrift store some time ago, but I went into the dollar store today for something else and saw that they have some there. It was a different brand, but it was the same kind of thing. I didn’t buy any because I still have some. You might want to check out your local dollar store too. Thanks Dona! I’m sure yours will be fabulous. I love white board too, and a I have a can of the spray. Just waiting to use it on something. Tuula, I had no idea there was such a thing! I’ll be thinking how I could use this stuff now…and no chalkdust-nice;) Pinned! Thanks Lora! It’s the coolest stuff, and very easy to work with. 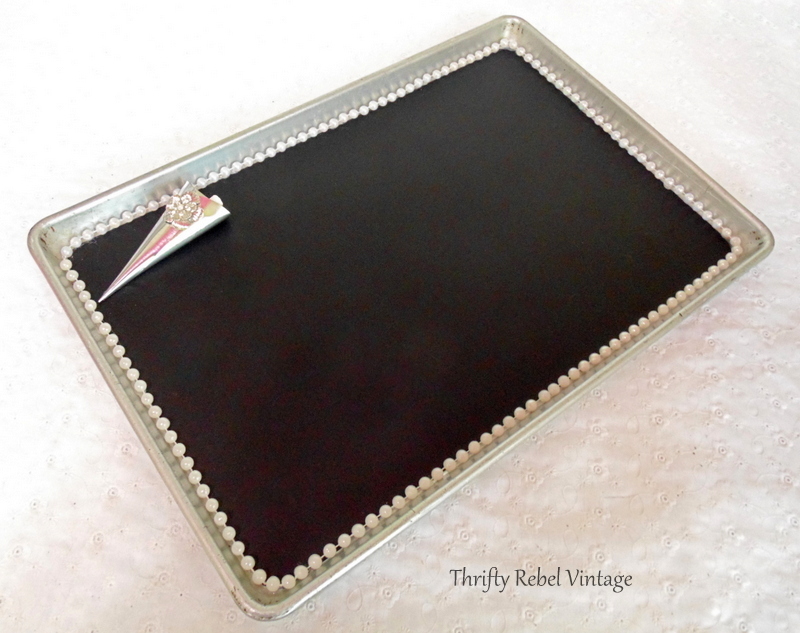 to an ornate silver tray..fancy meets practical. ? Thanks Mary! I did a silver tray chalkboard a few years ago, but it wasn’t a really ornate one. I used the spray paint on that and it worked well. I’d love to try the vinyl and see how it turns out. 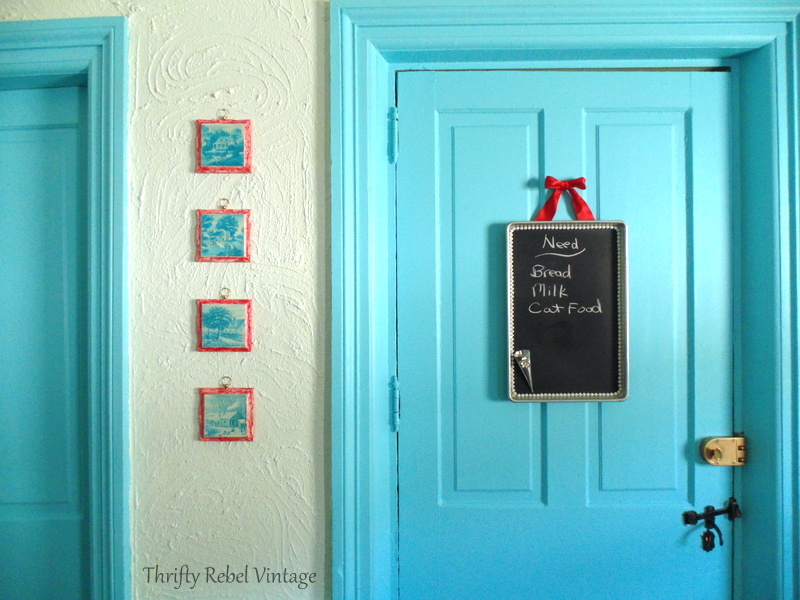 Hi Tuula, i love your cute cookie sheet chalkboard diy project you made. it looks so nice on the wall! Thanks Tania! I love your cupboards. I painted my computer armoire doors with the spray a few years ago, but I really love the chalkboard vinyl. I’ll be using it again for sure. 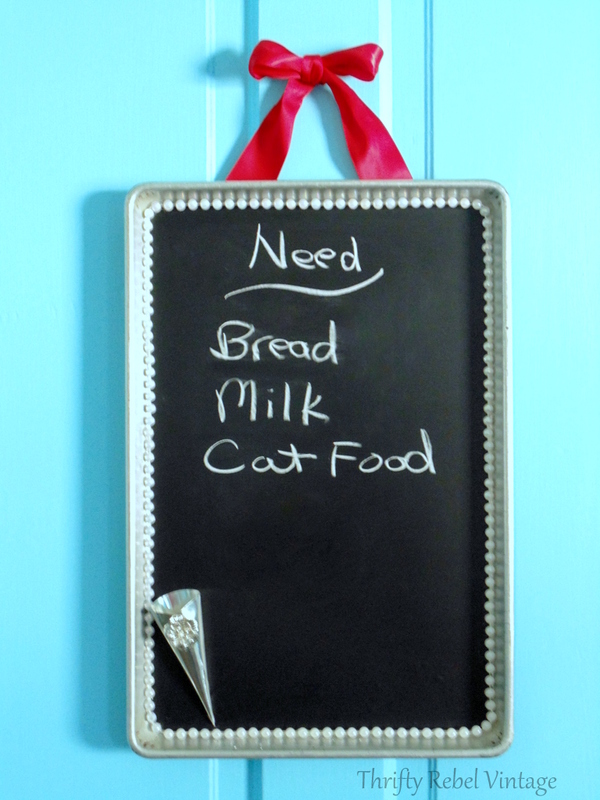 I have never heard of chalkboard vinyl before and it has been added to my shopping list. To think of all my Mom’s old baking sheets that we donated that could’ve been repurposed into chalkboards – one for each of our homes – makes me want to cry. Such a great idea and the chalk stick cone is so stink’n adorable and clever too! Thanks Marie! So sorry about your mom’s baking sheets, but you could thrift some that are similar and they could still remind you of her. 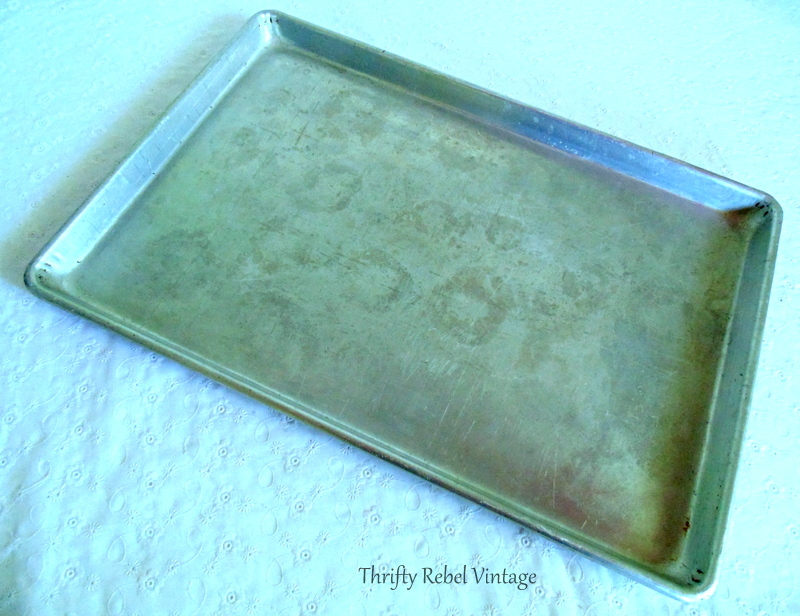 I have a thing for vintage aluminum bakeware and pick it up whenever it see it. Probably because it reminds me of my childhood. It’s very light, and I love the silver hues. Perfect use of an old cookie sheet and boy, do I have a few of those! 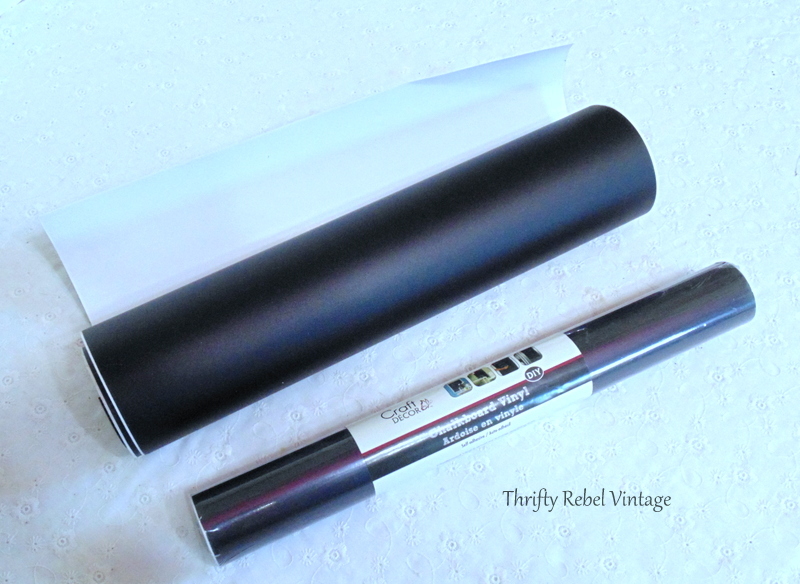 I have used the vinyl chalkboard paper and it is a breeze to use. It wipes cleaner than a regular chalkboard too. I have also used the chalk gel pens on it and it works fine. Great craft!! Thanks AnnMarie! I have some of the gel pens, but haven’t tried them on my chalkboard yet. I’m glad to hear that they work. Love this Tuula! 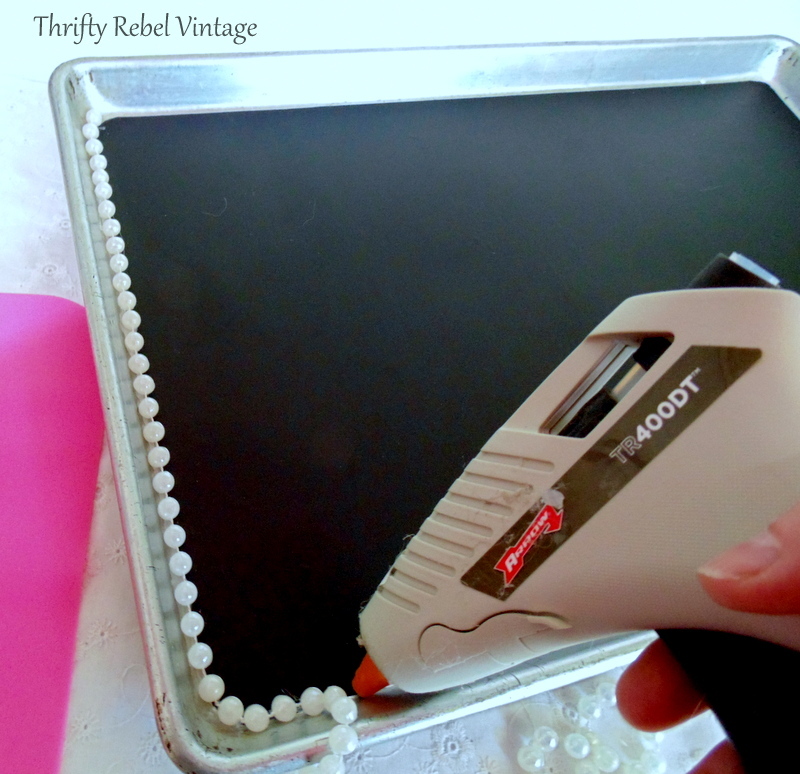 So cute with the pearls around the border & love the chalk holder. That really blings it up nicely. So you didn’t have to season it at all? Thanks Florence! Nope, no seasoning was required. As soon as I hung it up it was ready to go. And it cleans off so nicely with a very slightly damp cloth. So easy. Wonderful repurpose, Tuula, as always 🙂 Love the added glam of the pearls and ribbon, which as you say, ties it all in with your fab new kitchen–great job! Thanks very much Diana! I love the combo of old aluminum and pearls. There’s just something about it. One of these days I might actually finish my kitchen makeover. I can’t stop adding more projects. lol. I never heard of this product. The cookie sheet looks amazing. I love all of the special touches you added to it. Thanks so much Debra! I’m so glad that I finally tried this vinyl. I’ve had it for eons. It’s works great and is so easy. Great repurpose! I have been using a tiny string of pearls on the edge of juice can lid ornaments to hide less than perfect edges. Love bling! Scored some woven jute ribbon about 1/4″ wide that I want to try on a chalkboard. 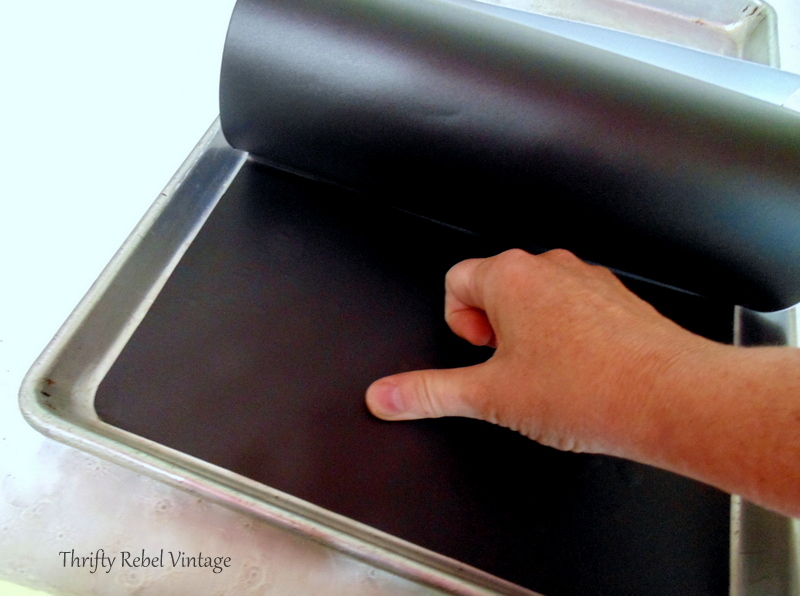 I painted a tray, unmasked it and was disgusted that the edges blistered badly; your vinyl eliminated that problem. The chalk holder is precious! Thanks so much Kathy! Your lid ornaments sound fabulous. 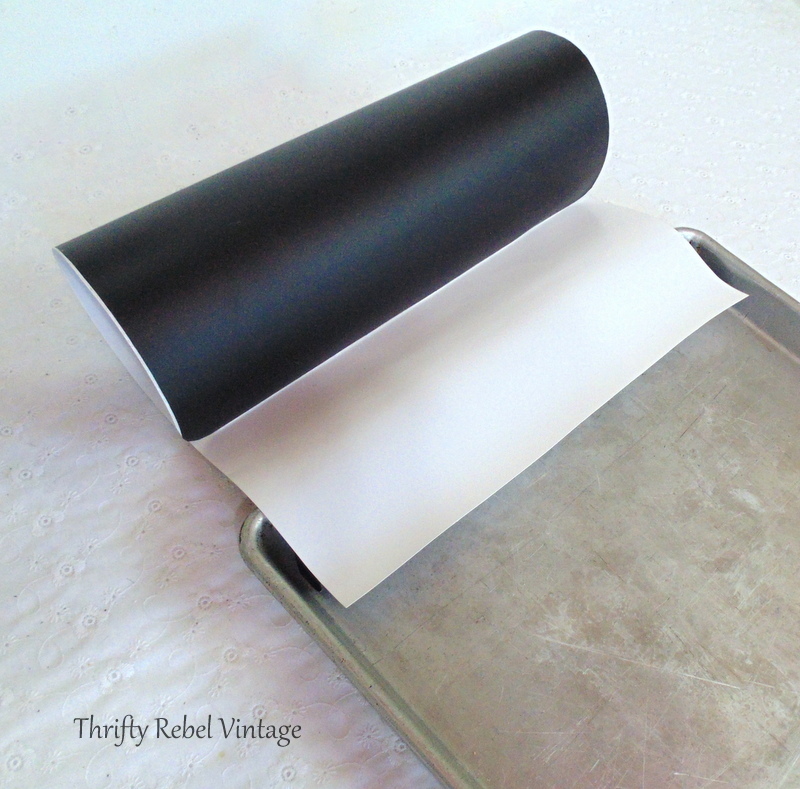 I think this chalkboard vinyl could be used on many things that paint just wouldn’t work as well. I’ll definitely be using it again. does the chalk erase off of the vinyl?? Oh yes, very easily. You can either dry wipe which leaves the usual chalky grayness or wipe with a very slightly damp cloth. Well this is adorable!! I think my favorite part is that decorating tip to hold the chalk!!!! Thanks very much Lauren! I needed something that would securely hold the chalk and the baking cone works perfectly. I love this idea! I especially love the little cone you made to hold the chalk and the beading that decorates the inside! I can hardly wait to try this! How do I pin this? Definitely don’t forget the cat food!!!! Very cute project! Since you can’t take it to the store with you though, get in the habit of taking a picture of it on your phone before you leave…no more trying to remember what you wrote on the list….the older I get the more ways I need to help remember stuff!!!! Tuula this is so clever, Instead of painting it you took the simpler way and just added the paper. And the addition of the beading really makes it look special. 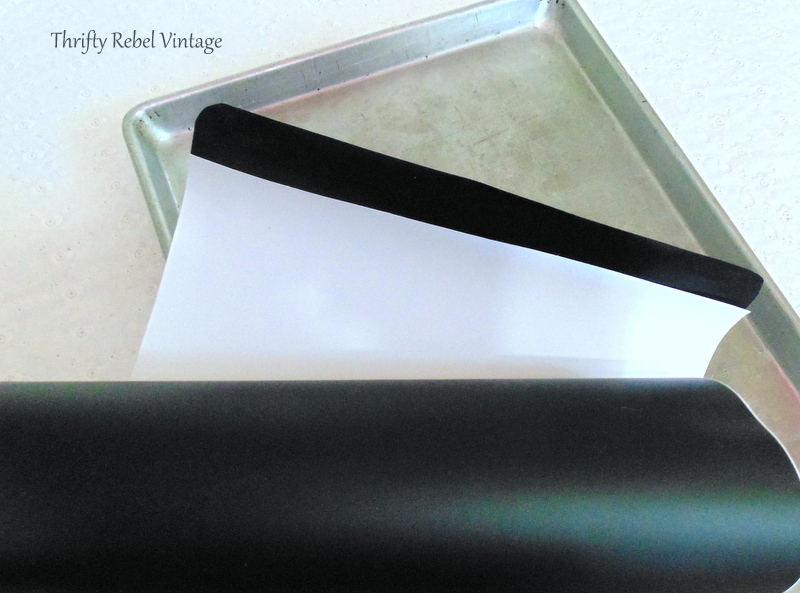 I love that peel-n-stick chalkboard paper! 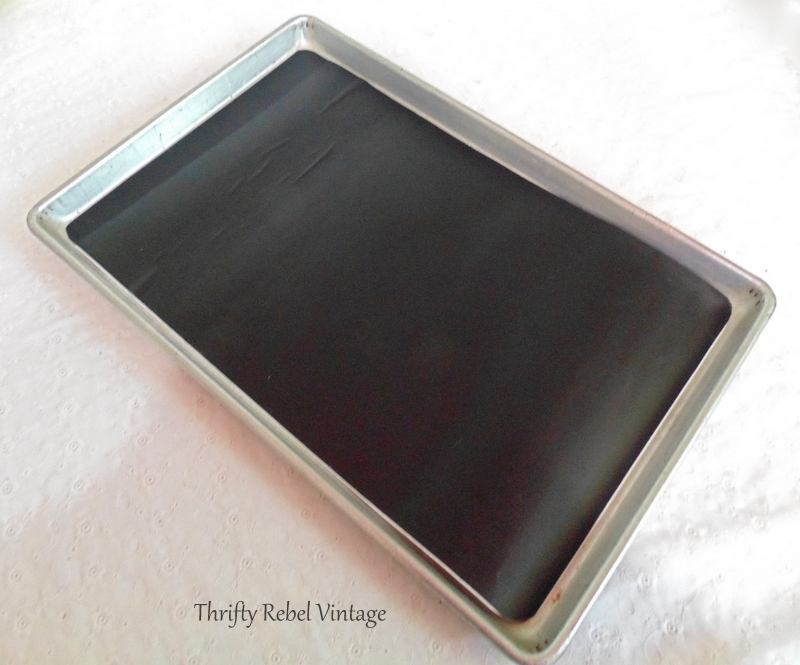 Thanks for sharing your cookie sheet chalkboard at Vintage Charm. It turned out so cute!